In 3G Wireless Networks, experts Clint Smith and Daniel Collins dissect critical issues of compatibility, internetworking, and voice/data convergence, providing you with in-depth explanations of how key standards and protocols intersect and interconnect. This guide digs into the gritty details of day-to-day network operations, giving you a chance to understand the difficulties service providers will experience in making the changeover from 2nd Generation systems (CDMS etc.) to 2.5 Generation systems like WAP and EDGE and finally to full throttle 3G networks. It describes key standards, digs deep into the guts of relevant network protocols, and details the full range of compatibility issues between the US (CDMA 2000) and European (WCDMA) versions of the standard. Plenty of call flow diagrams show you exactly how the technologies work. I really liked this book. I thought the diagrams were well displayed. I learned so much from reading this book. Experience in the networking field will help you understand 3G networks. This book has a lot of terminology. This book has a lot of usefull diagrams. Also this book has a lot of pictures. A picture is worth a 1000 words. 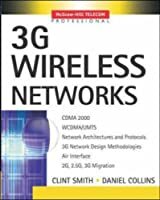 I would recommend this book to anyone who wants to learn 3G wireless networks. Its a pretty good book for those who are new to wireless and even those who’d like to learn more. It covers 1G, 2G, 2.5G and 3G wireless networks and various air interfaces used and/or are proposed for these networks. It gets over the ambiguities of various 3GPP releases and clearly describes each release (99, 2000-4, and 2000-5) and their associated network reference model. There is also plenty of good description on various 2G radio access standards (AMPS, TMDA, CDMA, GSM, WCDMA, CDMA2000) and their associated network reference models. While it doesn’t have in-depth coverage of any particular wireless topic, it attempts to give a broad overview on everything wireless and provides plenty of references for readers to follow up.